Barbour Valerie Ladies Waxed Cotton Hat olive classic tartan trim. Barbour has really gone to town with its latest range of waterproof hats for ladies. This sweet version is trimmed with a rose of olive waxed cotton and Barbour Classic tartan cotton, which complements the rest of the hat and matches many jackets in the Barbour jacket range. Make your choice of head size from the pull down menu below. 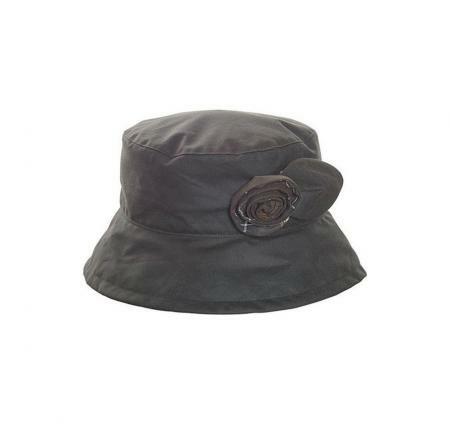 The Valerie waxed hat by Barbour is made from 100% waxed cotton outer, with 100% cotton lining.SALE! This Stockman coat evolved in New Zealand, where they know a thing or two about endurance riding in wet weather. The Barbour Stockman is equally suitable for watching professionals ride at Bangor or Punchestown in typical National Hunt weather. Please note the Stockman comes up VERY big. You'll probably need 2 sizes smaller than you think. We're happy to measure up for you. Corduroy collar studded for Barbour's optional hoods which are also listed on this web site. The corduroy collar also works well with the pewter wildlife badges in our gifts section. Press-studded adjustable fantail and leg straps. Storm cape. Elbow patches. Two large patch pockets with flaps. Brushed cotton heritage checked lining. Leg straps make sure your legs stay dry even in windy weather. Available in rustic brown only as shown. Length increases from 50.5 inches to 54.5 inches as chest size increases.